Cathay Pacific will be suspending its 3 weekly Toronto bound flights that are flown via Anchorage, Alaska from Hong Kong. The flight numbers are CX 828/829. This change will take place effective late Oct 2008. CX will continue to however offer daily nonstop service on this key route using their flagship Boeing 777-300ER. CX will also be suspending 4 flights on its Vancouver route by reducing it from triple daily to 17 weekly flights effective Oct 26th 2008. The reduced flights are CX 835/836 which will be flown 3 times a week only using an A 343. HYD - increased from 11 to 18 times a week. From July, 5 additional flights will be flown using an A 332 four times a week + one B 773. From Oct, two more weekly flights will be flown using a B 772. DEL - increased from 14 to 18 times a week. From July, all 4 additional flights will be flown using a B 772. BLR - increased from 8 to 15 times a week. From July, 2 additional flights will be flown using a B 772 and from Oct, the remaining 5 flights will be added using a B 772 as well. Besides increasing India, EK's Chairman has recently announced publicly in an interview that one new USA destination, Algiers plus one new Far East Asia destination will be added to the network this year. According to many, ORD-Chicago will be the new USA destination being flown nonstop from DXB using a B 777-300ER. Delta Airlines is once again striving itself on being recognized as the premier international carrier from USA as it announced new 4 weekly nonstop flights from its Atlanta hub bound for KWI-Kuwait from Nov 7th 2008 onwards. This new flight will be flown using a Boeing 777-200ER. 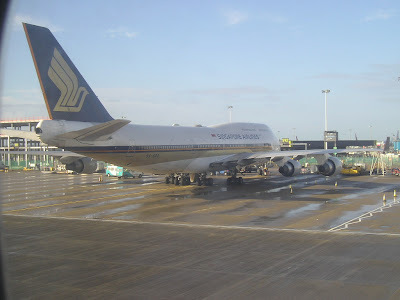 Singapore Airlines will be increasing its A 380 operated flights to London Heathrow from this July. SQ will now use the A 380 11 times a week instead of daily with SQ 318/321 getting the A 380 on days 1-3-5-7. SEA - reduced to 5 weekly A 332s from daily flights. BOM - capacity increased to 5 weekly B 773ERs + 2 weekly B 772ERs; previously was daily B 772ERs. BLR - capacity increased from daily A 332 to daily B 772ERs. IKA - capacity reduced from 4 weekly A 343s to 4 weekly A 332s. SFO - capacity reduced from daily B 744 to daily A 343. BOS - reduced to daily B 744 from daily A 343 + daily B 744. JFK - reduced to 4 daily flights from 6. ICN - capacity reduced to 3 weekly B 773ERs + 4 weekly B 772ERs. MRU - frequencies increased to daily B 744s from 4 weekly B 744s. PHL - reduced to 5 weekly flights from daily. IAD - reduced to double daily B 772ERs from triple daily. YUL - reduced from triple daily to double daily i.e. daily B 773ER + daily A 343. HAV - increased to daily B 744s from 5 weekly. SCL - increased from 5 weekly B 772ERs to daily. EZE - capacity increased to daily B 773ER from daily B 772ER. PEK - reduced to 10 weekly B 773ERs from double daily B 773ERs. 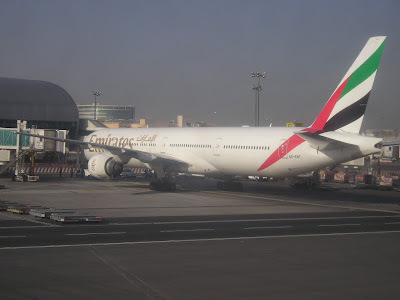 DXB - increased to 13 weekly flights from 12 i.e. 6 weekly A 332s + daily B 772ERs. BKK - capacity increased from daily A 343 to daily B 744s. GIG - frequencies increased to daily B 744 + daily A 332. Iran Air will be increasing capacity on its popular Tehran-Heathrow route by deploying its Boeing 747-100 from mid June onwards. It will be replacing the A 300-600R that is currently being used 4 times a week on this sector. Etihad Airways has officially confirms that it will be launching new flights to MAA-Chennai and CCJ-Calicut in India. Both cities will be served daily from Abu Dhabi using an A 320-200. This is being made possible with the recent UAE-India bilateral enhancements.